Today millions of public sector workers are striking over pensions. In the borough where I used to work every school bar one is closing completely or has part closures. These include faith school, academies and special schools. I know some of these head teachers would ensure their schools remained open through snow or illness and would rather snog Michael Gove than close their schools. Today however the schools are closed and the teachers striking over pension changes. Today public sector workers are marching, rallying and picketing. Many of them will have never been on strike before but this time it feels necessary. Like those head teacher in my ex borough they want to demonstrate their anger and dissatisfaction at the pension changes. It’s indisputable that public sector pensions have to change but the changes are going too far too fast. We Love Local Government explains this far better than I. Apart from changes to pensions I think the public sector also just wants to make its voice heard. Since the coalition government came into power they’ve constantly criticised the public sector and have branded them feckless and lazy; greedy pension grabbers that shirk the real world of hard work for a cushy time being babysat by the state. The government response to this day of action has been one of that teacher who says, ‘you’ve let yourself down, you’ve let the government down but most of all you’ve let the public down.’ If I were them I’d be a bit worried at the anger that has provoked such a massive walk out rather than threatening to withdraw their offer over reforms. But I guess that’s why I’m not in politics. My ego is sadly just not vast enough. What do we want? Pensions! When do we want them? Before we’re too old to enjoy them. When I was a little girl and went to play at my friend’s house we would bandage her teddies and give them pretend medicine but when it was her turn to visit me, we would line up our toys and pretended to be teachers. Many years later she grew up to be a doctor and I grew up to be… well I think you can guess. When I was that little girl I didn’t think about pensions or the public sector I just wanted to be a teacher when I grew up. And even when I went to university, in between lots of practice snogging boys and drinking too much alcohol, I worked hard to learn my profession. I can’t remember rubbing my hands together in glee and planning to work in the public sector because of the pensions or because it was an easy option. Nascently political, I wanted to teach in state schools so I did. But teacher pensions are a perk in a job where you get yelled at by parents on a daily basis, abused occasionally by the kids you try to teach and slagged off regularly by the media and politicians. So I’m behind the strikes on Thursday. Michael Gove has already got his knickers in a twist at the thought of striking and calling it a ‘massive inconvenience.’ It will be, especially to some working parents who, as Guardian journalist Suzanne Moore points out, use schools as a child-minding service. It’s frustrating and annoying when train drivers or airport staff go on strike but it’s a last resort and it lets the world know how fed up people are. The ATL (Association of Teachers and lecturers) is striking for the first time in its 127 year history. 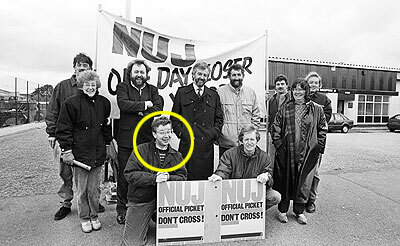 Gove (circled) on strike: teachers will lose respect of they strike . Perhaps you should start listening to the teachers, Mr Gove. Because of course you’d never go on strike yourself, would you? For more on this debate read the excellent page in The Guardian. I appear at 1.40pm.